"Bendin' in the Wind" is the forty-fifth episode of Futurama, the thirteenth of the third production season and the thirteenth of the third broadcast season. It aired on 22 April, 2001, on Fox. It guest-stars Beck as himself. Bender becomes a folksinger after being broken, and starts touring with Beck. 1.1 Act I: "This thing can't go faster than 80,000 miles per hour?" 1.2 Act II: "My shell ran." 1.3 Act III: "I didn't get my beads!" 1.4 Act IV: "Put the metal to the pedal to the other metal!" This plot section needs updating. The following plot section requires a going-over, such as giving it more detail and description. Act I: "This thing can't go faster than 80,000 miles per hour?" While walking, Fry and Bender come across the NNY Hole Project. Fry gets a recently excavated Volkswagen Transporter microbus that he pushes back to Planet Express. Though petroleum no longer exists, a can of whale oil is supplied. Bender starts to open it with the can opener, but he is caught by the magnetic forces and is horribly damaged. at the hospital, Bender learns that his hydraulics are ruined, he can never move again. While wallowing in his misery, he notices Beck, his favourite folk singer. Beck invites Bender to be his new washboard player, giving him robotic mini-arms, which allow him to play by scraping them across his broken chest. Bender can now fulfill his dream of becoming a folk singer. Act II: "My shell ran." Bender and Beck go on tour, with Fry, Leela, Amy and Zoidberg following them in the microbus. While at a laundromat, Zoidberg's shell runs, ruining their money. 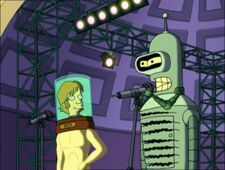 Beck and Bender organize a benefit for broken robots and Bender starts writing his own song. After he finishes writing his song, he is visited by Fry and the rest; they are shocked to find he is capable of moving again. Act III: "I didn't get my beads!" Bender is wondering how he can play at his upcoming concert, Bend-Aid and thinks of something... by faking still being injured. At his concert, Bender sings with Beck, while the others make money by selling "love beads", pearls coughed up by Dr. Zoidberg. Bender receives a giant check before singing the song he wrote, "My Broken Friend", and right before he finishes his song, his secret is exposed as he unconsciously starts to move to the rhythm. Robots who are really broken now hate him for faking it. Bender escapes his former fans rushing the stage, lands in the VW, and drives off with the others. Beck and Co. give chase in the tour bus. Act IV: "Put the metal to the pedal to the other metal!" Bender and the rest start driving through town, trying to outrun Beck and his minions. The VW falls off the Golden Gate Bridge, because it is now a hover bridge (no span) and they aren't in a hovercar. Bender grabs a cable and manages to save himself and as the others hold onto him, slow the van's drop. Once safe, Leela releases her grip of Bender (making Fry and Amy lose theirs), causing him to be slingshot into the air. He lands near Beck's bus, where Beck recovers the huge check, but spares Bender. With a magnet placed on his head, singing "Bender is Great", Bender returns to the crew, who are paddling home by using the bus as a raft. According to the DVD commentary, the part where Fry holds up a bong after the Professor asks, "Where's the device that lets you speed or slow the passage of time?" was not asked to be edited by the FOX censors because the bong was referred to in the script as a "weird bottle." Cedars-Sinewave Hospital is a play off of Cedars-Sinai Medical Center. Non-speaking appearances are made by the heads of Neil Young and Joni Mitchell, on Beck's tourbus. Bender's music, as shown on the sheet music (approx 11:07), is actually the melody of the first movement of Beethoven's Fifth Symphony. The sheet music appropriately notes it as "No. 5" at the top left corner. An allusion to the splitting of Czechoslovakia. West Virginia's name remained unchanged. Washington D.C. → Washington A.C. Possibly a pun on eBay or other "e"-prefixed names. The name is written, perhaps officially, in AL1. A Humorbot, though presumably not Humorbot 5.0, who appears fully functioning in earlier and later episodes. The headless Robot Chef, who we see explode in "A Fishful of Dollars". The drummer in Beck's band is a Neptunian. Bender eats some Olestra chips from the 1990s and suffers the usual side effects of the product. Patchcord Adams is a spoof of Robin Williams' portrayal of real-life medical doctor Patch Adams in the movie bearing his name. The name "Bend-Aid" is a reference to the charity supergroup Band Aid. Band Aid itself alludes to the line of adhesive bandages Band-Aid, later alluded to in "Stench and Stenchibility", as "Band-Ape". The broken robots that "bum rush" the stage reenact a scene from the movie Freaks. Cylon and Garfunkel are the 31st century equivalent of Simon and Garfunkel. They sing the latter's "Scarborough Fair". Leela tells Fry that gasoline was an environmental disaster and that whale oil is now used instead. In the 19th century, petroleum began replacing whale oil in many applications and may have helped protect whale populations. Issues come up involving the state names, which were presumably only thought up for this episode, as they are not used at any other point in the series. In "A Head in the Polls", Washington D.C. is not called "Washington A.C.". In "The 30% Iron Chef", Bender references Eugene, "Oregon", differing from "XORegon". New Jersey is not called "New New Jersey" in any other episode. The bag of chips Fry finds at the beginning of the episode, supposedly from the 20th Century, are in the same packaging as the bag of chips Scruffy eats in "The Route of All Evil", though with a fat free label. Hippie: Wow, look at the colours. These'll go great with my soul. Zoidberg: Glad you like them. I've been making fine jewellery for years, apparently. Bender: Hey, yeah, I could write a song! With real words, not phoney ones like "odelay". Beck: "Odelay" is a word. Just look it up in the Becktionary. Zoidberg: Oh, I don't know, Fry. I think I'm too poor to follow a band around in a van. Beck: [honks horn] Come on. We have to get to the concert in time and make the audience wait for it to start. Bender: [After realizing he can move again.] Oh, crap!! It's a miracle! Bender: [crying] No, don't you see? I was a hero to broken robots 'cause I was one of them. But how can I sing about being damaged if I'm not? That's like Christina Aguilera singing in Spanish. [He gasps and stops crying.] Wait, that's it! I'll fake it! Professor Farnsworth: Where's the device that lets you speed or slow the passage of time? Fry: [picking up bong] Under the seat. This page was last edited on 30 June 2016, at 22:10.